Our area tree population is still recovering from the devastation of Superstorm Sandy, and with the new threat of the Emerald Ash Borer, we need to continue to support our environment. Back to Nature Home and Garden is giving new meaning to the traditional Holiday Giving Tree. In the garden center’s spirit of giving, the tree itself is the gift—both to children and the environment—and Back to Nature is inviting children and their families to participate this holiday season. 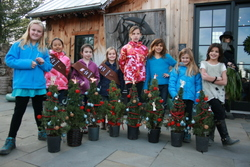 During its Holiday Tree Giveaway event, November 27 - December 24, Back to Nature is donating 5,000 free evergreens to local communities in central New Jersey and inviting children to experience the joy of decorating them in their Santa’s Workshop located at their 3055 Valley Road garden center in Basking Ridge. In exchange, Back to Nature is asking them to commit to planting the live Spruces in their yards next spring as a lesson in sustainability and the importance of giving back to the Earth. The Emerald Ash Borer has killed more than 25 million trees in the United States. The destructive pest was first found in New Jersey in Somerset County in 2014 and has since spread to six counties. The stakes are higher for the second annual Holiday Tree Giveaway, as Back to Nature has introduced a challenge to local municipalities: the town whose residents claim and pledge to plant the most trees will win another 100 shade trees for a public restoration or beautification project. Everyone is invited to participate in the Holiday Tree Giveaway by stopping by Back to Nature during their regular business hours. The Home and Garden Center is transformed for the Holiday Season into a festive Santa’s workshop and winter wonderland holiday shopping boutique. Visitors are invited to enjoy s’mores, refreshments and browse for environmentally-friendly, artisan-crafted housewares, gifts and more. For more information about Back to Nature and the Holiday Tree Giveaway, call 908-350-7506 or visit: http://www.backtonature.net . Back to Nature Home and Garden is a premier garden and retail destination with an ecological approach to gardening and environmentally-friendly living. In addition to being a full-service organic nursery, Back to Nature features unique, nature-inspired housewares, decor and gifts, floral services, resources for local, sustainable food, and an event center for hosting educational classes and workshops. The design/build division of the company creates customized regenerative outdoor spaces that inspire reciprocation between people and nature. For more information, call 908-350-7506 or visit: http://www.backtonature.net .